Birthdate: February 22, 1959 in Orange, Texas. Career Highlights: Toney excelled in high school football, starting all three years as a running back at Bridge City High School. He was named Office Player of the year his senior year and appeared in “Faces in the Crowd” in Sports Illustrated for his performances in football. But his real love was running. His best time in high school was 156.7 in the 880 yard dash and he anchored the 4 x 400 relay. After high school he quit running for better than two decades. In his early forties, in spite of health challenges and being substantially overweight he began running again. He recently began his third year with the Houston Elite Club and last year won his first Gold at a National Championship level. Recent Performances: Toney won the 400M and placed 2nd in the 200M at the Southwest Masters Track and Field Championship held in Coppell, Texas, July 10, 2010. On January 30, 2011, Toney won the 200 Meters and placed 2nd in the 400 Meters at the Univerity of Houston Masters Track and Field Meet. There was a great field for the 4 x 200 Relay, with the Houston Elite Track Club fielding 4 teams in that relay. Background: Toney lives in Houston, Texas and regularly trains with the Houston Elite Club at Rice University. Toney works as executive editor for a Christian book publisher. 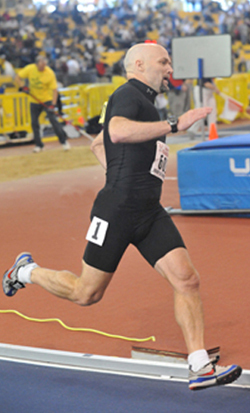 He won his first national gold medal last year at the 2009 Indoor Masters Track and Field Championship in Maryland. He ran the first leg in the gold medal winning Houston Elite 4 x 400 Relay team. If his health, determination and training holds up, Toney is looking forward to joining other Houston Elite athletes in a 4 x 800 relay team assault on the world record. The Latest: Toney’s ran in the Southwest Masters Championships in Austin in July, 2012 and took Silver in the 100, Bronze in the 200 and another Silver in the 400. It was just too hot to run any relays that day. In his spare time, Toney serves as owner of a Christian Publishing Company (www.ipibooks.com).